Covina Family Dental offers patients in Covina porcelain veneers to restore cracked, chipped, worn-down, stained, uneven, irregularly shaped, or misaligned teeth, well as teeth with gaps in between them. Patients will be pleased to see how well porcelain veneers can fix tooth imperfections and rejuvenate their smile. Dental veneers are made of either resin or porcelain. 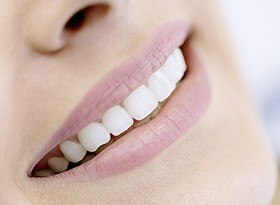 Our Covina cosmetic dentist only uses porcelain veneers because they resist stains better than resin veneers do and because they more closely resemble natural teeth. 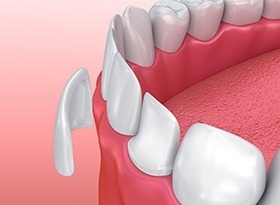 Dental veneers work by covering a tooth’s surface. Veneers are quite thin and made to match the color of natural teeth. Dr. Danny Tran bonds veneers to the tooth’s enamel, transforming the size, shape, or color of the tooth. The veneers can adhere to a single tooth, a few teeth, or all teeth as necessary. Under the right conditions and with the right care, porcelain veneers can last about 15 years. The veneer process includes preparing teeth and then bonding porcelain veneers to the prepared teeth. It is minimally invasive and can be done in about two office visits. Dr. Tran must first prepare any teeth to be covered by the veneer. He will shave down the enamel of the tooth to be treated by about one-eighth of an inch on the front surface and biting edge of the tooth. The procedure should not be painful. However, he may choose to apply a local anesthetic if needed. Once the patient’s teeth are prepared, Dr. Tran will make a mold of the teeth and send it to a lab. The lab clinician then uses the patient’s dental impression to make the veneers. While waiting for the finished veneers, the patient will use temporary dental veneers that can be seen as a preview of the fantastic smile that is to come. The patient next returns to Covina Family Dental once the permanent porcelain veneers have arrived in the office. Dr. Tran will bond the final veneers to teeth using a dental adhesive. The dentist or staff member will lastly smooth and polish the veneers before sending the patient off on his or her way. Dr. Danny Tran may request that the patient come in for a follow-up visit to make sure veneers are adhering properly. In addition to meeting other criteria as discussed below, suitable candidates for porcelain veneers include those who have a gap in between teeth or suffer from stained, worn, cracked, chipped, irregularly shaped, misaligned, or uneven teeth. Porcelain veneers are sturdy, but they are not as sturdy as natural teeth. Porcelain veneers can crack or break. They cannot be repaired and will need to be replaced if that happens. This is why patients who suffer from bruxism or have weak teeth may not be suitable candidates for porcelain veneers. However, Dr. Tran has several alternative treatments at his disposal to help patients who aren’t candidates for porcelain veneers attain better, brighter smiles. Those who are interested in porcelain veneers can contact Covina Family Dental to find out if they are suitable candidates for porcelain veneers or more complex cosmetic procedures including dental implants or dentures. Patients must take good care of porcelain veneers for optimum, long-lasting results. West Covina veneers patients should avoid chewing ice, grinding their teeth, biting their nails, or participating in any other bad habit that may chip or crack veneers. Veneers are irreparable and need to be replaced if damaged. To schedule a one-on-one consultation, or to learn more about porcelain veneers in Covina, Glendora, and West Covina, please contact Covina Family Dental by calling us or by filling out our online form.